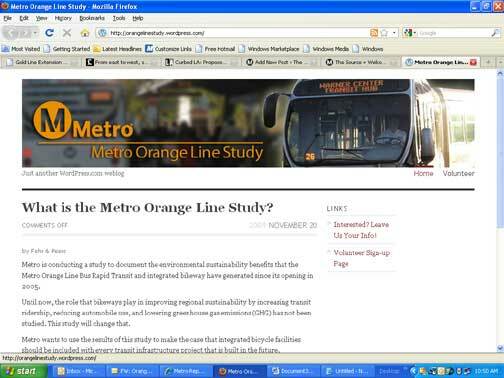 Metro is looking for volunteers to help study the sustainability benefits of the Metro Orange Line and its integrated bikeway. The agency is trying to determine how, or if, the bikeway and storage facilities have encouraged alternative travel modes, reduced car usage and reduced greenhouse gas emissions. Volunteers are needed to survey bike riders, walkers and even park-and-riders who are boarding the Metro Orange Line. Volunteers are also needed to count bike and pedestrian trips on the Orange Line bikeway. The study, when complete, could make the case that bicycle facilities should be included in every new transit infrastructure project Metro builds. And what self-respecting cycling commuter in L.A. doesn’t want that? The survey dates are scheduled for Wednesday, December 9 and Saturday, December 12. Metro plans to survey eight stations on December 9 from approximately 6 a.m. to 2 p.m. and two stations on December 12 from approximately 10 a.m. to 4 p.m. They’re seeking two-hour shifts at a station from volunteers. Can you help this crucial bike effort? Volunteers can sign up by clicking here. Any questions about volunteering should be directed to Steve Crosley at 310-458-9916 or via e-mail.